Even though this was a new Earthcache that was only 4 miles form home and had been published 10 days earlier, I like everyone else it seems had been saving this to do on International Earthcache Day, and fortunately the day started with blue sky and sunshine which made it a nice place to go for a Sunday morning stroll. 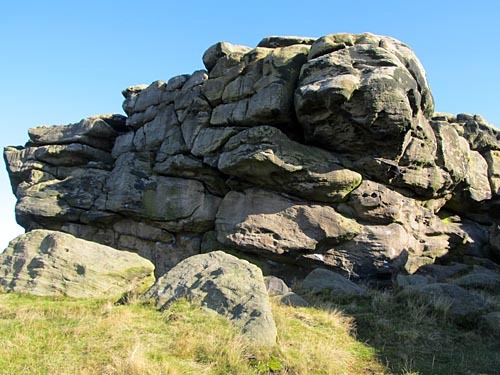 ‘Forget what the ‘scientists’ say on the notice board – the formation of the crag goes back to the day of giants, when Rombald lived in this part of the world. 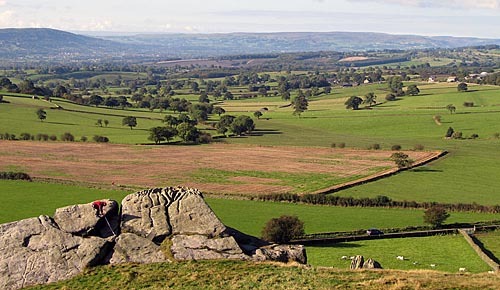 It was then very different to the landscape seen here today, in those days the area was just a big bog, so Rombald threw a large rock into the bog to use as a stepping stone, the rock that is today Almscliffe Crag. The story goes that Rombald was striding from this stepping stone to the top if Ilkley Moor some seven miles away when he caught his foot on another rock – the Cow, and split off the Calf. The other possibility for Almscliffe Crag’s formation was shown on TV in January 1980 when the crag appeared as the title object in the Blakes 7 episode ‘Volcano’ (Series 3 Episode 3) This was exciting at the time as one of the big TV shows of the time was filming near us !